1) How did Firearms Source start and how did you get involved? 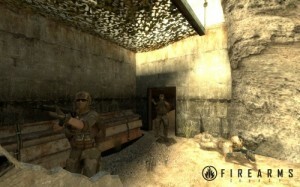 Firearms: Source was a project that Issa and X^18 started to recreate the Firearms awesomeness on the Source engine. It started off as a very small and quick project, and as the team rapidly grew, so did the design document and visual standards. 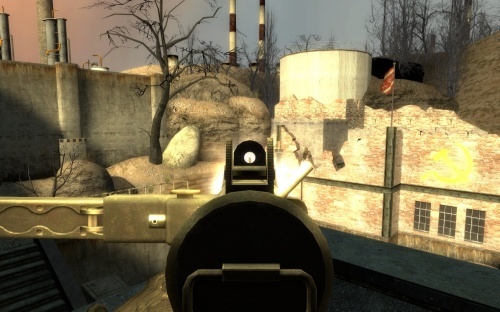 The mod was announced in July 2006 and I had joined up as a level designer two months later. I have been developing FAS for the past 5 years as a level designer and was eventually made development lead in January 2010. Six months later, we released Firearms: Source 1.0. 2) Some people complain that FAS is too generic and “Just another shooter”, what has the team been doing in order to counter this? If people are complaining that FAS is too generic, then they simply haven’t tried the mod. It’s not necessarily one thing or another that separates us from the rest (no gimmicks), its the whole package. While we share similarities with other games (both retail and mods), we have a feature set that includes the best of the best and removes those that we find frustrating. For instance, we emphasise skill over just being at the right place at the right time. We have an armor system that allows you to take quite a beating if someone is spraying at you thus eliminating the spray and pray effect. Furthermore, we use a high headshot damage multiplier to give those who aim, the advantage. 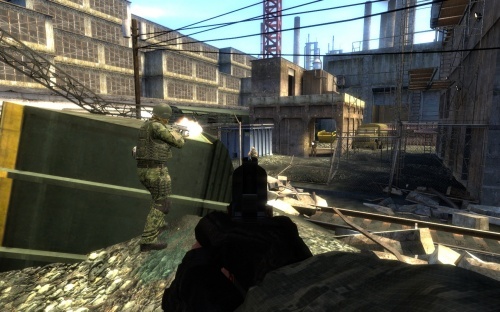 Some of the more recent games tend to use high damage models that influence camping and slow down gameplay. While you get the satisfaction that your weapons do more damage in those games, you also have every player in the server camping behind cover waiting for a player to move out into the open just to be insta-killed. Not Firearms: Source. We encourage fast paced gameplay and want to give the assaulting players the chance to move up and capture the enemies objectives. This isn’t to say that we cripple support roles like snipers and machine gunners. In fact, they are necessary for either initiating or facilitating the advance. How are you going to advance on the enemy without covering fire? Who’s going to take out that machine gunner who has your squad suppressed? And we don’t limit the support roles to machine gunners and snipers either. By using our skill system, you can rank up and gain abilities like: healing and bandaging your teammates with the Medic skill, spotting enemies with Marksmanship, giving ammo with Gunnery, or rallying your squad with Leadership, regardless of your weapon loadout. This means that you have the flexibility of grabbing an assault loadout, and grabbing support skills. One of the things that really makes us stick out from the other modern shooters is our level of customization. In FA:S 2.0, our attachment system allows you to equip aimpoints and suppressors on almost all of the weapons and we plan to add more attachments down the line. We also add a level of detail to our weapon models, animations, and sounds that most retail shooters neglect. Quite frankly, I can honestly go on and on about what makes us different, but it would probably be easier if you just gave FAS 1.0 a shot, and come back for some more with the release of 2.0 on Steam. 3) What does the latest update (FAS 2.0) add or remove? Well, with our release of 1.0, we received TONS of promising feedback from the community. In regards to gameplay, we ripped out all of the old weapon values and rebalanced them. In fact, I will soon be discussing soon how we have rebalanced FAS 2.0 in a developer blog on our website. 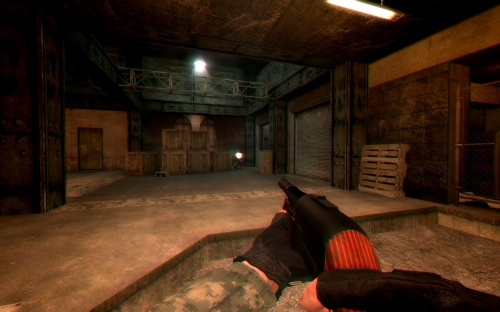 We are also adding new skills, new weapons, new maps, and our first version of the attachment system. We are going over all of our old and dated content with a fine tooth comb, and are updating it to current and next-gen standards. While we are making a lot of large changes, we are also doing the small things to make sure that FAS provides a better user experience as a whole. For instance, we have recently added dynamic crosshairs to allow new players to better understand our accuracy system. It’s the small things like that may seem trivial, but do wonders for user experience, which is who we are looking out for. Another big step for us is the addition of Steamworks which allows us to track player stats, include achievements, and release publicly on the Steam store. We truly appreciate the opportunity Valve has given us, and we are doing our best to make sure FAS 2.0 is one hell of a release. 4) What are some of the major problems you experienced during development? When developing a game as a side project, you must assume that at certain times in your development, real life will pull your developers away. However, some mod developers need to be micro managed in order to get work done, while others flourish on their own. It is a matter of time management and focus. One thing that’s very difficult, that we have been struggling with, is finding hard working and talented folks. It seems a lot of modders nowadays have trouble focusing on one project at a time, and end up working on multiple projects. This isn’t a problem unless you start making commitments that you can’t fulfill. Not only does their inability to focus on a project affect their workflow and ability to actually bring a product from start to finish, but it also negatively affects their teammates who are relying on them to get that critical piece of work done. It’s especially hard trying to find eager and self motivated developers who are willing to work for free, as we notice a move that most developers are making, to go indie. Aside from team management and productivity issues, you also have the annoying problems that come with tools and engine specific problems that may hinder your workflow. In fact, recently, my hard drive just failed, although, I had backed up all my work a week prior to the failure. There’s also things like hammer crashes that really just get under your skin. It’s not really a major problem but you still have to deal with it. Most of the major problems I have found just deal with making sure your team is interacting positively and that you are properly motivating your team and facilitating communication. 5) What advice would you give to some one who is interested in making mods? If you are truly interested in making mods, or games, then do some research and find the field that most interests you. If you enjoy creating creatures or player models, then perhaps look into becoming a character artist and find some tutorials. While there are more and more game design schools out there, most game developers and modders today have no doubt learned most of their fundamentals from tutorials and just doing it on their own. As long as you are self-motivated and are eager to learn, you can create some pretty sweet content. And by all means, do not give up. Your first few projects may seem silly, or just look terrible, but its all a learning process. With each iteration, you will get better and better, and soon enough, your hobby may become a potential career. 6) FAS 2.0 is graphically amazing compared to 1.0, how did you go about improving graphics so much? Thanks a lot. Well, when you are developing a game/mod for a long period of time, the content that is created within the first couple months is bound to look of lower quality than those made 4 or 5 years later. This was another reason to just go ahead and release the game already (1.0), not to just get community feedback, but if we waited any longer, a lot of our assets would be obsolete and dated compared to current standards. Essentially the longer our game was under development, the older our assets looked. What we have been doing now is going over those old assets and improving the quality using new techniques we have learned along the way. We have been doing this with every bit of content in the game, from weapons to maps and to sounds. We are doing our best to make sure that FAS 2.0 really stands out on its own and catches the eye of the gamers browsing the Steam store, Desura, or any other gaming website featuring our media. 7) What is your favorite weapon or map in the mod ? I’ve gotta say I love me some FAMAS. It’s high rate of fire, along with being one of the more mobile assault rifles, makes it a versatile combat weapon. You can switch from burst, to semi, and then back to full auto depending on what type of engagement you are in. Got an enemy all the way across the map? Semi-auto. Trying to get that headshot kill in mid range? Switch to three round burst. Enemy popping around the corner? Blast him with 25 rounds of 5.56 NATO cartridges at 1000 rounds per minute. In regards to my favorite map, I have to go with Snowstorm in 1.0 but IwoJima in 2.0. 8) When can we expect the release of the latest update? You can expect it when its done. Haha, but in all seriousness, we are aiming for the third quarter of this year, 2011.